The growing number of anti-Semitic terror attacks in France has inspired thousands of French Jews to pack up and "make Aliyah." Israel welcomed 7,000 French Olim in 2014 and the country is expecting 10,000 to 15,000 more in 2015. However, the massive wave of Aliyah from France raises once again the conversion dilemma to the forefront of public discourse in Israel. According to Prof. Sergio DePergola, an expert in Jewish demography worldwide, the intermarriage rate among French Jews has been around 40% for the past 20-30 years. As a result, The Jewish Agency reports, about 10% of new immigrants from France in 2014 were not Jews according to Jewish law (Halacha). Rabbi Haim Drukman, the chairman of YBA in Israel and Rosh Yeshiva of YBA Or Etzion, recognized long ago the need to create a user-friendly conversion program for such new immigrants. Back in the early 1990s Rabbi Drukman took the lead and founded the "Ami" (My People) conversion program at his yeshiva in order to welcome thousands of new immigrants from the former Soviet Union who wished to "join the fold" in a fully Halachic conversion. Over the years Rabbi Drukman has signed the conversion papers of over 50,000 new immigrants. 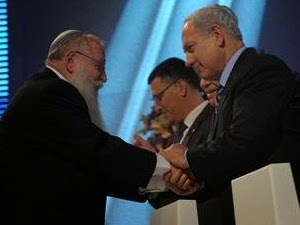 He was awarded the Israel Prize for Lifetime Achievement in 2012, which included recognition for his service to Israel as the head of the national conversion authority for the Prime Minister's office. YBA Or Etzion's Ami conversion program has already sponsored conversion classes for French olim for the past three years, and is in position to take the lead once again for the national effort on behalf of this new wave of Aliyah from France. Just another way that YBA is Training Israel's Future!